The 2013 Mazda 3 has a lively personality, one we wish it could share with more compact sedans and hatchbacks on the road today. It has some of the life in its controls. It's proof that inexpensive cars and great gas mileage don't have to preclude driving fun. 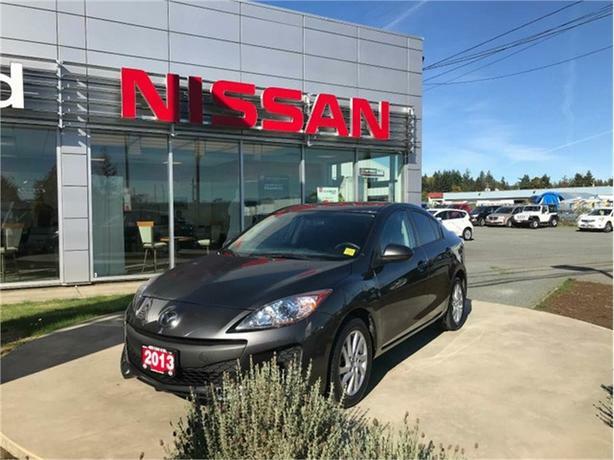 This Mazda 3 is equipped with comfort features we all love and deserve, like the heated front seats for our cooler morings to come and when sunny days hit, you have a moonroof to brighten up your drive and allow the fresh air to flow through. The Bluetooth will be great for when you are waiting for that important call when on the go, so you can stay safe and not distracted when cruising around the town. Call one of our experienced sales consultants and set up your no obligation test drive today at 250-287-7272. Located at 2700 North Island Highway, Campbell River BC, V9W 2H5.